A key preoccupation of the NMI was with understanding “why it had not proved possible to give effect to the promised constitutional rights as quickly as we had hoped and expected”. In exploring this question the NMI arranged a series of deliberations culminating in a two-day conference in February 2018. Importantly, however, the NMI ensured that these deliberations were built on a strong empirical base backed by targeted research on different dimensions of poverty and inequality. This report is prepared as a constructive contribution to dealing with tough policy choices. The work is empathetic towards policy makers, recognizing the extraordinary difficulties in managing complex urban environments. It does, however, make it clear that unless the state finds a way to engage positively with the actual processes shaping lives and spaces in the city, solutions to poverty and inequality will remain elusive. As Hornby et al (2017) argue, the myriad and complex ways in which people live their lives are often rendered invisible, leaving formal policy as a weak instrument in influencing processes in urban and rural areas. The report asks a set of questions around: how people live their lives (for example, how they access housing, livelihoods and services); how they engage with each other; how they engage with the state; what spaces they use; and, how these spaces are regulated. 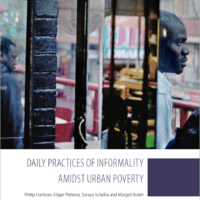 Through these questions we explore the multiple forms of informality, and the connections between them; and, also the ways in which formal and informal activities and governance processes connect and disconnect. The report was prepared with a specific commitment to explore people’s lives in an open ended way without either romanticizing or demeaning informality.